It seems to me that throughout the holidays, often and at the last minute, we decide to have some people over. The cheese platter is such an easy idea, but the cheese counter always baffles me. Cow? Goat? Sheep? Yikes. Soft? Ripe? Hard? What’s best? Turns out, it’s not about any of those things. On a crystal clear fall day, I drove to Washington, Virginia, the first town surveyed by George Washington. It’s a charming village (pop. 187,) perhaps best known to food folk for the Inn at Little Washington, Chef Patrick O’Connell in residence. 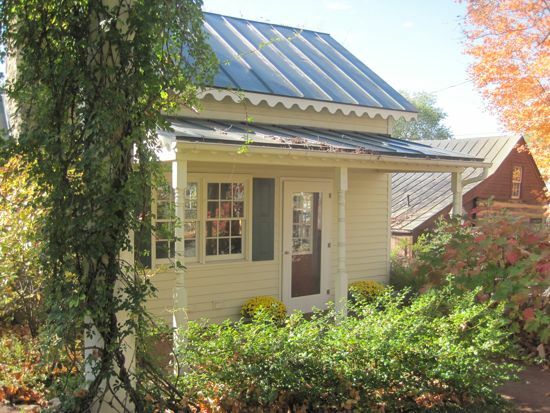 This ‘other’ Washington is in a valley between the two ridges of the Blue Ridge Mountains. In this valley, the rich soil and green grass produce exceptional livestock, small grains, vegetables and fruits. Susan James says there is a terroir associated with the Rappahannock Valley. 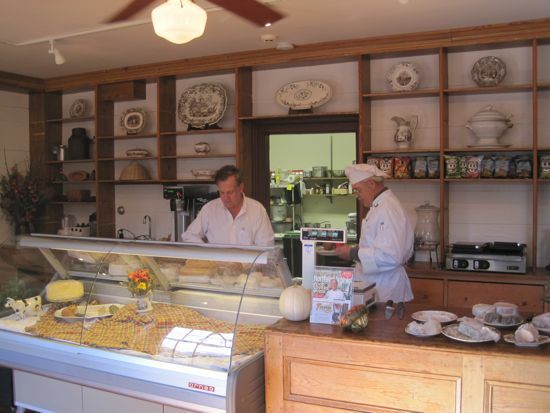 Susan has deep roots in this valley, but don’t underestimate this French-trained proprietress. She runs the Mercantile, develops the menu of interesting sandwiches and salads, finds the baker who made the best carrot cake I’ve ever tasted. 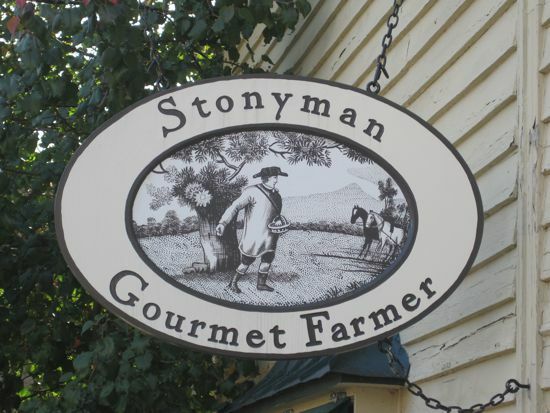 Mostly, she curates the spectacular cheeses sold at Stonyman Gourmet Farmer. I’ve been a long time customer of their Bethesda, MD, shop (open Wed., Fri, and Saturday) and Susan had been encouraging me to visit the Mercantile. The building Stonyman occupies is the original mercantile for the town, the original counter, thick, well worn wood, smooth to the touch. 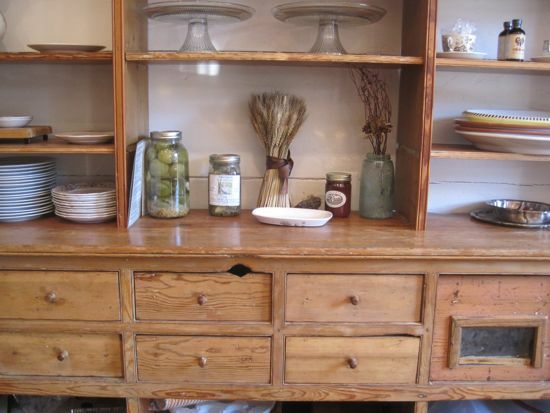 The cabinets and drawers, built to store grains and such, glow in the sunlight. 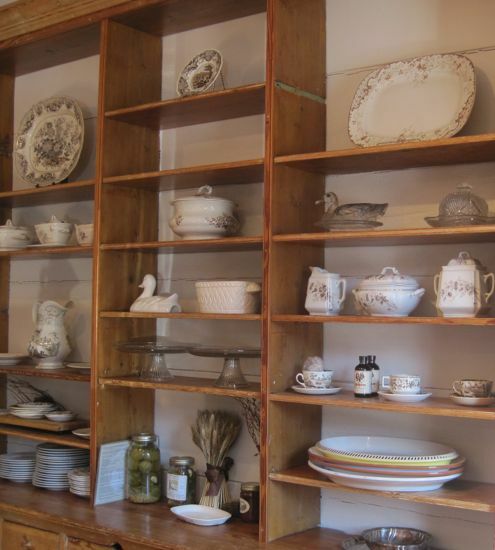 The shop is charming and rustic, but somehow elegant at the same time. 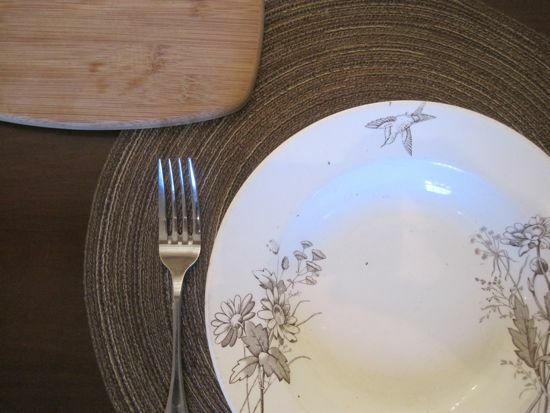 Susan’s extensive collection of brown transferware has a lot to do with that impression. There is a small room with tables, where Susan and I enjoyed coffee, a muffin, and eventually a spectacular lunch. 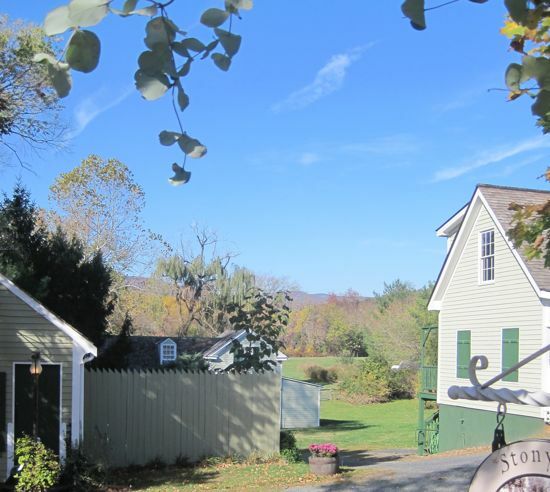 The late 17th c. Mercantile is made up of the main shop, a dairy, smokehouse, cook’s cottage and expansive outdoor spaces. 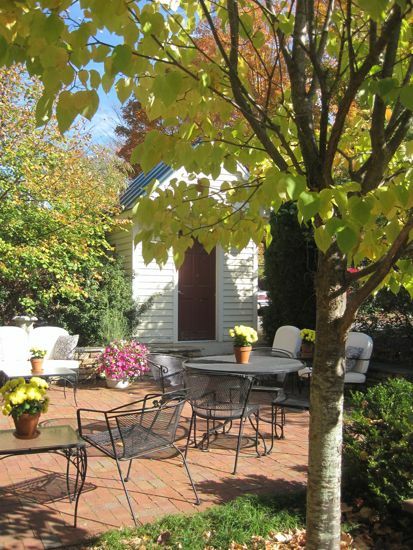 It’s a delightful spot for lunch, or an event. I found it charming in every aspect. 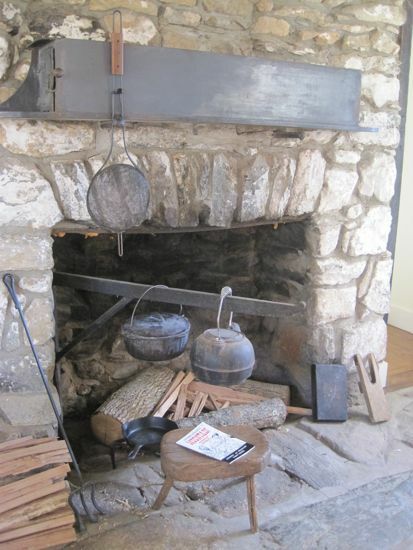 As much as I could have lingered in the cook’s cottage, exploring the original cooking fireplace and the wonderful displayed tools, I had a purpose. I wanted to learn about cheese platters. Susan made it seem simple. We have the option of either serving individual cheese plates – this is perfect for a dinner party – with slices of each cheese fanned out on a plate or these fantastic bamboo mini-platters – offered after dinner, sometimes with salad or fruit, and before dessert. This is such a nice presentation, and I like the portioning, as it results in fewer little mysterious nubs of cheese floating around the refrigerator. On the other hand, if you’re having a grazing-type cocktail party, or watching football, and want to offer larger pieces of cheese, plan on three or five cheeses (why odd numbers? it’s a rule! who knew? ), and set them out, left to right, from young, lighter tasting to more aged, stronger cheeses. Each cheese should have its own knife. 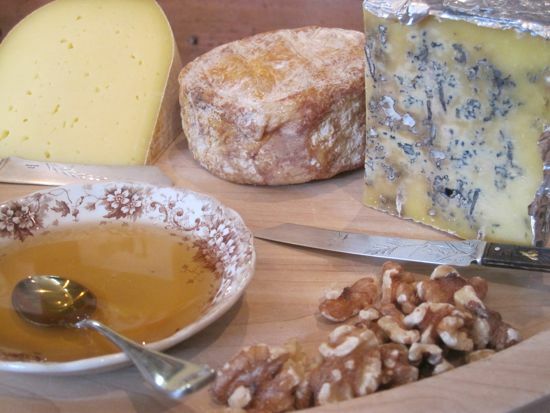 Garnish with toasted spiced nuts, onion confit, figs, grapes, jams, chutneys and honey. Susan avoids pickles, unless there is charcuterie. The vinegar will overwhelm delicate cheeses. 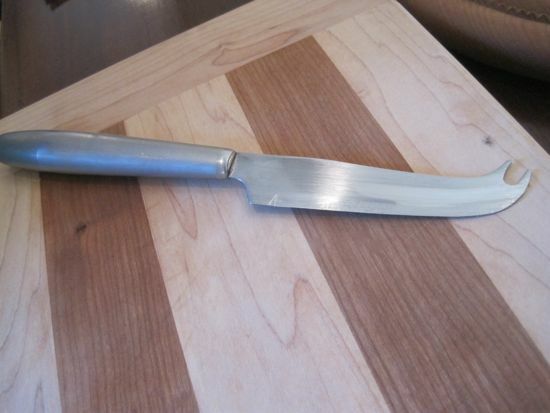 The perfect cheese knife is shaped like this, sharp edged, with a forked end, to lift the cut piece and offer it up. Go to a cheese counter you can trust. Be hungry. Ask to taste cheeses for a platter. Taste each cheese, in the order of strength of flavor. First find a gentle, buttery, oozy cheese. Then step it up with herb crusts or chestnut leaf wraps and a little older. A little stronger. Harder cheeses. More complex rinds. All the way to blue – the sharpest, strongest cheeses. Taste – don’t worry if it’s goat or cow. Do you like it? Now, don’t overdo. 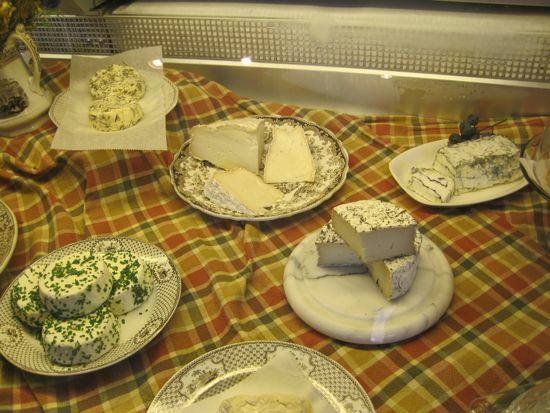 Taste maximum three cheeses per category or your palate will be exhausted. Susan and her staff made up this gorgeous platter as an example. She presents cheese individually – in order of their strength. Use the condiments to break from mild to strong. Nibble a walnut. Have a grape. Then taste the next. 1. Soft Ripened Jersey Wheel – (cow) – serves about 16 pieces and goes with everything. buttery. 3. Aged Emmenthaler Reserve – harder, aged, more complex. nutty tasting. 4. 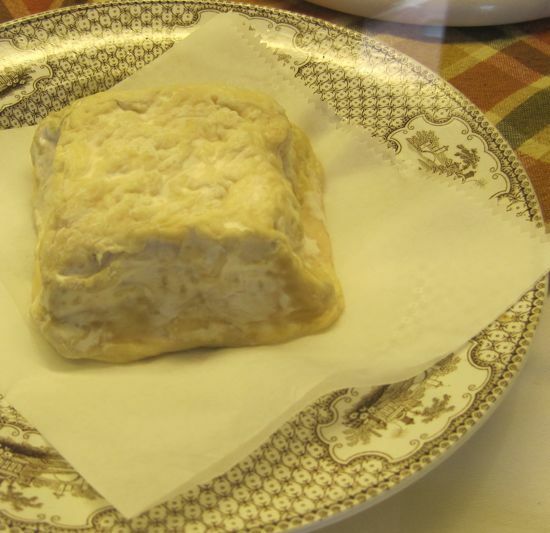 Surface ripened, washed rind Chevre – well aged, a little stinky, runny, creamy. Have some leftover cheese after your party? An elegant, complex cheese elevates your soup, salad, and bread dinner. 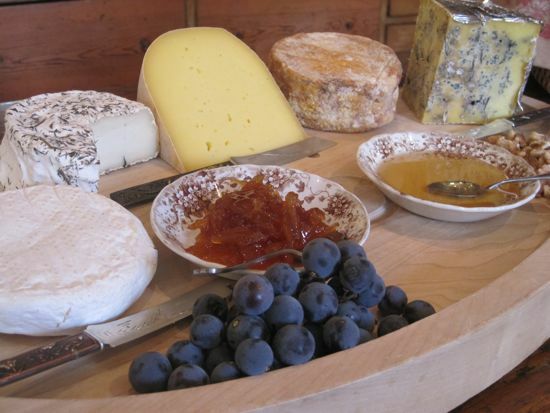 For all these cheeses, and so much more, visit Stonyman Gourmet Farmer at the Bethesda Women’s Farm Market (Wed., Fri., Sat. ), at the Bethesda Central Farm Market (Sundays) and at the Mercantile in Washington, VA from Thursday through Monday. Lovely photos! I usually use a bright green leaf under my cheeses when I set up a platter. I really like the idea you suggest of serving individual cheese plates at the end of a dinner party – less mess, etc. Thanks! I’m always confused about how to do cheese platters! I love them all, but I know some people are a bit more choosy when it comes to strength and texture…thanks for the tips! What a beautiful place to spend an afternoon! Besides, you had me at ‘cheese’. Ahh, I love the fact their cheeses aren’t wrapped in plastic! Even the high-end organic store here with the huge cheese counter, carrying everything from imported Mantego to local camembert, has everything wrapped up tight. I learned about cheeses in France, where you can always pop open the thin wooden carton to take a deep sniff through the parchment inner wrapper. Looks like you’re taking full advantage of your resources there! I am a cheese fanatic and love assembling platters, boards, plates with seasonal decorations. Your post is very informative, and the photos are lovely. Such an informative post! Beautiful pictures! Ah, what lovely pictures! I moved to California almost 40 years ago and am madly in love with the state. But come fall, I dearly miss the East Coast. This was a great reminder of the beauty! Oh yeah… I LOVE CHEESE for the end of a meal!